Christmas 2009 finds us content and largely healthy. The Seattle weather in November and December can be hard to take with the dark skies, short days and unremitting rain, but Thanksgiving and Christmas help to brighten the mood. And then we try to leave during parts of January, February and March to make it through to better weather. What do I mean by "largely healthy"? No major diseases, but annoying ailments. Randy has had trouble for many months with gout in his feet and, once, a neuroma on his foot. For a time, he was on crutches, and for many months, even though he was able to walk some, he really wasn't able to use the rowing machine, run, walk long distances or hike and felt frustrated and a little stir-crazy. Fortunately, he finally went to see a rheumatologist in late November, who told him that his foot problem was definitely gout and that in three months he would have forgotten all about it. He was very happy to hear that. The doc put him on a stronger course of prednisone and he has been improving. 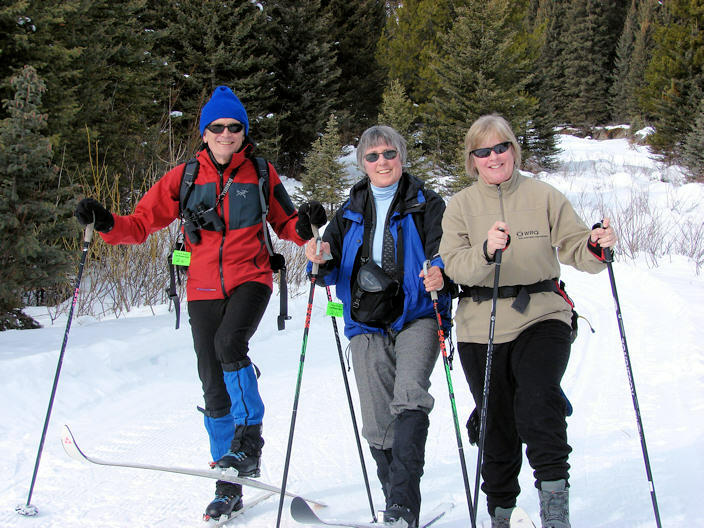 The picture of us above with our friend Linda Lewis was taken at Big Sky ski resort in Montana, where we went in February to celebrate some 50th and 60th birthdays among our friends. It was beautiful, the weather was good, we saw several moose, and had a great time skiing. Randy and I did another trip to Montana in June to birdwatch and take in the scenery. It was a wonderful trip and we saw some fantastic birds when we stayed at the Nature Conservancy's Matador Ranch in the northern prairies. The scenery in the Big Hole Valley, Yellowstone and along the Bear Tooth Highway was gorgeous. We started out the year with a trip to San Diego for a wedding. While there, we visited my cousin David Brooks and his wife Peggy and had some great birdwatching in the San Diego area and the Anzo Borrego desert and Salton Sea to the east. In March, we had our annual reunion with my siblings and their spouses, this year in Charleston, S.C., the location selected by my twin brother Fred. It was a very enjoyable experience. Our reunion this year will be in June in Toronto, the location selected by my sister Elinor. In April, we had a wonderful trip to southeastern Arizona with our friends the Fiddlers and their delightful friends, Rainier and Jutta from Germany. We saw great birds and great scenery and had a fun and relaxing time. I had a quick trip to Kansas City in May for the 75th birthday of my sister-in-law Mary. It was good to see Mary's family and also some Hadley relatives. We have two ¼ of a season tickets to Mariners baseball. After several years of less than inspiring performance from the team, we are hopeful the Ms will contend for the pennant this year. Rather early to be thinking about that, I suppose. I was asked to join the board of the Washington Ornithological Society this year and have undertaken various projects for their newsletter and Web site. I also was asked to join the Municipal League, a good government organization that studies local issues and rates candidates. I'm on the ballot issues committee and the transportation committee. I'm back to a life of having to maintain a posture of objectivity on local political issues. I had kind of enjoyed giving up the cloak of objectivity when I retired, but the Muni League insists upon it. Randy and I also have been delivering meals to homeless encampments once a month. I took a political science class this fall quarter at the University of Washington called "International Conflict." The professor was very good and the class very interesting. It covered the history of warfare, and various theories as to what makes war more or less likely, and also the ethics of war. We're going to the Big Island of Hawaii in January. In February, we're traveling to San Diego for a week. My golfing buddy Linda will join us for part of that trip to play golf. The rest of the time, Randy and I will birdwatch and relax. In March, we're going kayaking in Baja with friends. It's Toronto in June. And we're planning on a trip to Argentina in the fall. Randy is already starting to learn Spanish. If you live out of town, consider a trip to our neck of the woods. We'd be glad to put you up!